I had the opportunity to take exactly one picture before I had to get in the water to escape the mosquitoes. They were thick, beastly and swarming, jumping on every exposed bit of skin. But this is where we went the other day. A friend took us for a drive, away from the ocean, to visit Cedar Creek Falls. It was gorgeous and green and the water was clear. It was lightly raining which meant we had the place to ourselves. Swimming around the base of the waterfall, there were small fish that joined us which seemed to find me, and only me, tasty. I am also, much to other’s delight, a mosquito magnet. We filled up our diesel tanks yesterday, which is not noteworthy in itself but it took us half a day so that’s where our time goes! Today we are headed back out to the islands and slowly going to be heading north over the next week. More often then not, our days are pretty boring. We will spend three days servicing winches (and still not be finished with them) or a whole day doing laundry by hand with other assorted household tasks mixed in there. When things go wrong, they tend to go really wrong or we are so deeply invested in a project that the disappointment that comes with its failure or our inability to finish the job, leaves us down for awhile. But on the good days, it’s like the universe aligns itself to give us a day or even just a moment of perfection that makes it all worthwhile and leaves us giddy for days to come. After our last post, several people commented that our life seemed hard sometimes and that’s true. I’ve heard cruising described as extreme highs coupled with extreme lows. But then there is just the in between, the everyday life. For us, it’s normal that grocery shopping takes an ENTIRE day, that we have to be conscious of every iota of electricity that comes in and out, likewise with water. I’m not going to lie… on occasion it can be frustrating but for the most part it’s just our normal. But then there’s days like this one (see below!) that while seemingly benign, make it all right again! On the 3rd winch... only 6 to go! 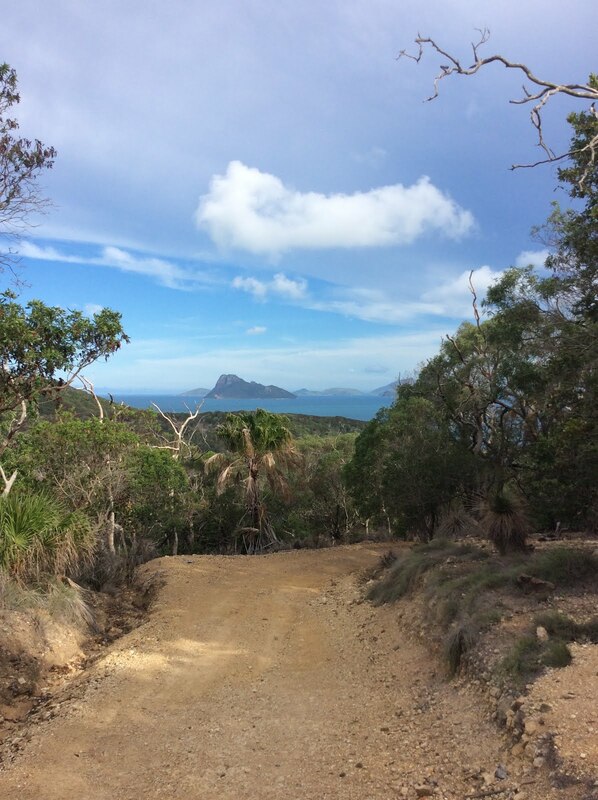 Last month, we were holed up in Driftwood Bay on the south side of Hamilton Island for a week or so to protect ourselves from the northerlies. With the exception of the extrusion of runway and the two jets that land and take off each day surrounded by a smattering of small planes and helicopters, this side of the island is relatively untouched. This is in comparison to the other side with a marina, shops, resorts and high rises. 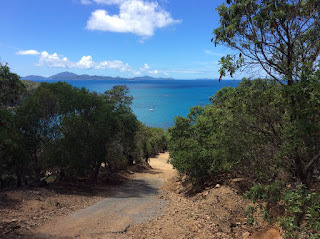 As much as we prefer the untouched side of the world, we learned that there was a free shuttle that went around the island so we wanted to make some time to check it out. There were several beaches where we thought we could land and get us close to our destination, the bus stop. One of these beaches happened to be right next to the airport runway. The runway was surrounded by a fence plastered with signs that said “Forbidden” & “Unauthourised Access Prohibited.” We had absolutely no intention of crossing the fence but this beach was on the ‘safe’ side of that fence. There was an additional huge sign on the fence above the beach next to a locked gate that said “Airside Area. Authourised Access Only. Fines exceed $5000.” and a big Australian government emblem. But it was attached to the fence and again, we had no intention of going near the fence so we felt we were fine. So we were strolling along watching the planes land, waving at the trucks going by (none of whom waved back! ), when all of the sudden from the other side of the fence… “Hey, how did you get in there? !” Apparently… we were still on airport property. This poor guy was clearly frazzled, umm-ing and ahh-ing over what to do with us, when I suggested we could just leave??? With the threat of a $10,000 fine looming, he finally escorted us back to Dingbat and told us where we could land to have access. Call us stupid but we have thought through our decision to land on that beach multiple times since then and still feel as though it’s pretty clear, at least to us, that the beach was an ok space. All of the signs were on the fence, a barrier which we had no intention of crossing. When we were escorted back to the beach, the guy banged on one of the signs (on the fence) to make clear to us that we were in the wrong we kept our objections to ourselves as he was letting us go so we weren’t going to argue with him about the ambiguous location of the sign. In the process of walking back down the beach to Dingbat, Bryce’s shoe broke. Thinking that our day was doomed before it had even really started, we faced the prospect of having to head back to Batty and find shoes for him. But randomly, and fortuitously, there was one spare flipflop in the dinghy for the correct foot. So we were back on track. 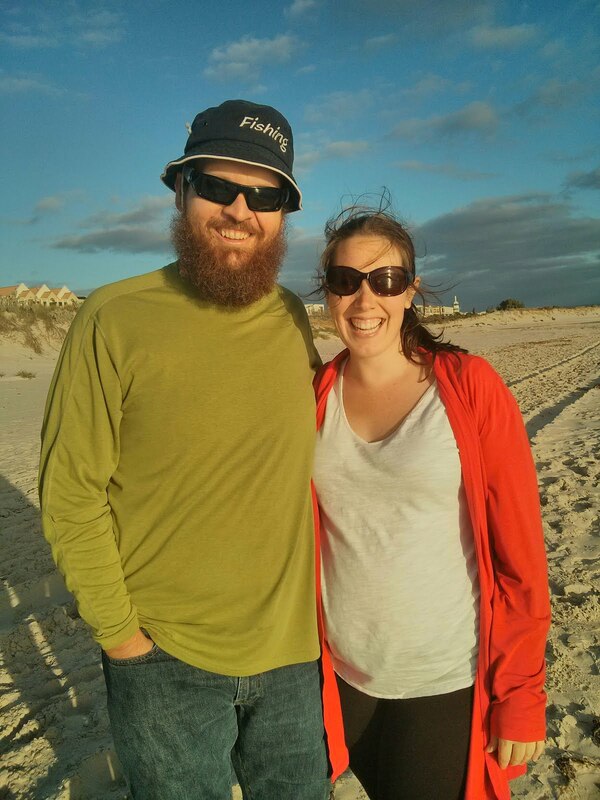 We headed around to the other beach, pulled Dingbat up and set off to town. The ONLY downside of landing in this location over the other was that now we had to hike up and over a mountain… but we did it! I won’t call it the most pleasant experience in the world but it got us where we wanted to be. 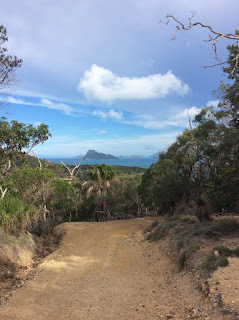 On our walk, we even saw a spotted deer, which I didn’t even knew existed on the island! We caught the shuttle and headed into town. 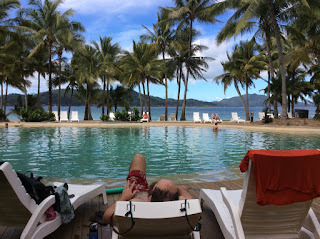 The inhabited side of Hamilton Island is technically one giant resort, made up of many smaller resorts and shops that try to create the village feel. It has a post office, fire service and even a small school. But everything is the same. Everyone is driving around in the same electric buggy, all of the shop fronts are the same, all of the bottled water came with a Hamilton Island logo and every one was carrying around Hamilton Island Bags. I can’t quite put my finger on it but it seemed almost eerie, quite Stepford. That being said, we had a lovely day exploring the Island via air conditioned bus (it was really, really HOT!). When we made the decision to get off the bus, it was to spend the afternoon relaxing in the pool to try and beat the heat. The pool was like bathwater it was so hot. Faced with a hike to get home, we wanted to try time our departure so that we were hiking in a cooler part of the day, but didn’t want to be caught in the dark and also wanted to stop by the bakery on the way bake to replenish our stash. Someone (me!) read the sign wrong and we missed the bakery closing by 15 minutes… major bummer. Reading back over this, this day doesn’t seem like a huge adventure, but when you compare it to servicing winches, it sure takes the cake! For the past week or so, we have been subjected to the remnants of ex-Tropical Cyclone Winston. Basically what this translates to is strong winds and torrential rains. We were able to get off the boat a couple of times (not without getting absolutely saturated, of course!) but otherwise we were pretty boat bound. 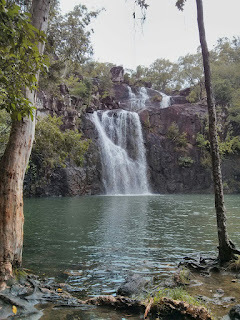 It took about five days for cooler temperatures to come in to accompany the rain and that brought welcome relief, i.e. we were no longer sweating inside our aluminium can! And while this rain brought an abundance of water, a week plus without seeing the sun meant that our solar panels weren’t able to do their job and our batteries were suffering. 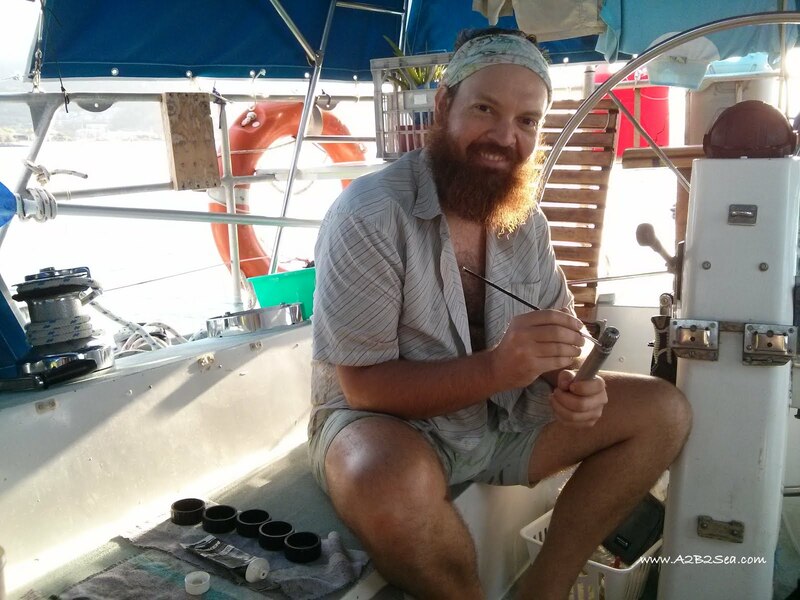 Last April, when we rewired our boat we added two more solar panels (for a grand total of four) and did NOT reconnect our Wind Generator. There was an issue with regulating the intake of power from the Wind Gen and was thought that it could’ve been hurting our batteries. Since we had just replaced our battery bank, we wanted to keep it from harm as much as possible and so did not reconnect the genny. So that left the Solar panels as our only option to naturally replenish our power. When the sun is shining, we have an abundance of power. More power then we know what to do with! But since we hadn’t seen the sun in awhile, we were struggling and our only option was to run the engine to recharge the batteries. We are a sailboat, we don’t like running the engine. It’s noisy and smelly. 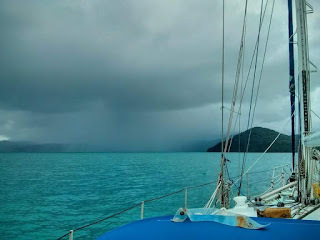 But we figured that rather then sit in Airlie Beach running the engine, we may as well go somewhere and that was how we ended up motoring across to the islands in the middle of a downpour. Bryce was a champ, navigating Batty through it all, while I was (and will probably forever more continue to be) a fair-weathered sailor. Luxuriating down below and coming up, wrapped snuggly in Bryce’s rain jacket, on occasion when the rain eased up. Bryce had just accepted that he was going to get wet so the jacket was superfluous! As we approached Cid Harbour on Whitsunday Island, we watched as a giant front of torrential rain passed directly through the harbour in front of us. We willed it to move faster so that we didn’t have to anchor in the middle of it. By some miracle, the rain let up to a mild spit just as we were ready to let the anchor down and no sooner then we were snug down below did the clouds open up again! What we were lacking in power, we made up for in surplus water. As long as it was raining, we literally had an unlimited supply. We had buckets out in the cockpit that were overflowing with beautiful fresh water. The only caveat was that it was ice cold. We were each able to take long, might be a stretch to say luxurious, showers and wash our hair, throwing water around without a care in the world. I could hear Bryce chuckling down below every single time I doused myself with a bowlful of ice cold water and squealed. I returned the favour when it was his turn! I did the dishes in an entire sinkful of water… absolute luxury. Though the forecast still looks grim (90-95% chance of rain everyday)…. hold on, it’s just started raining, I’ll be right back! Well, the weather people win today but what I had been about to say, was that we woke up this morning to sunshine and blue skies and were looking forward to getting off the boat. We can hear the rivers running on the island that we have previously only seen dry so we are looking forward to exploring them. Hopefully it clears up later so we can still head ashore but in the meantime, we are working through our library! Perfect rainy day activity!